The 500 has since gone through several owners including the Hughes Tool Company ,McDonnel Douglas, Boeing and now MDH Inc. 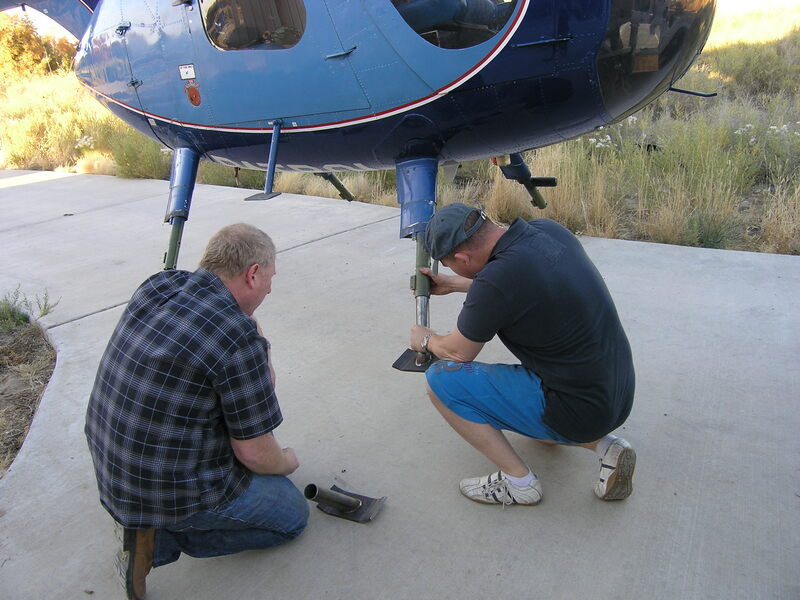 I initially started looking in the USA for an old OH-6A ex-military example of the 500 which was within my limited budget that I could restore but the CAA and FAA just made that option too difficult and restrictive. I eventually found a 500C HS civil model through a great aircraft broker I had been working with. This machine had only just come up for sale and hadn’t even been marketed yet. This aircraft was a little unusual in its history in that the owner flew regularly but then developed heath problems and so one day parked it up and then it just sat there for almost 14 years as he couldn’t bear to part with her! 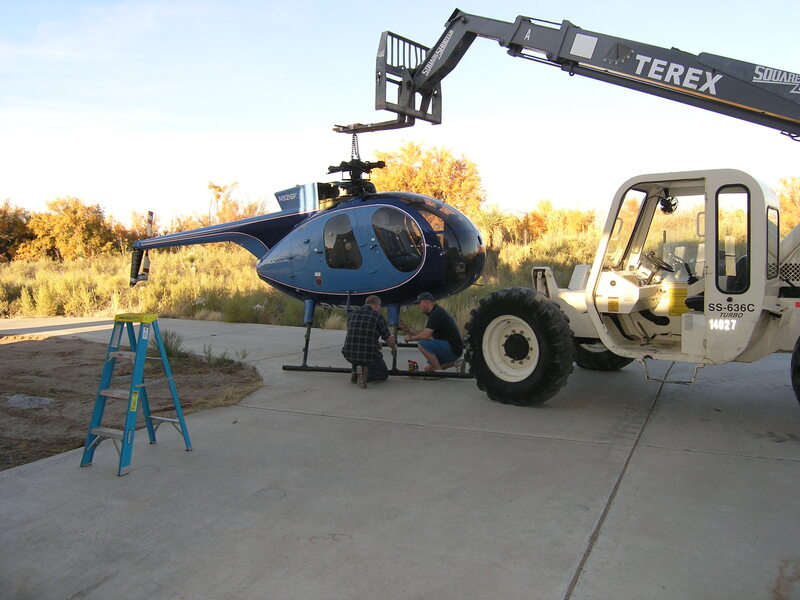 Normally this would be really bad for any aircraft, but this heli had been stored in a sealed hanger in New Mexico -one for the best places on the planet for storage due to its warm temperatures and very low humidity being at 4000ft ASL. It has only had 2 owners since leaving Hughes at its Culver City factory in 1974- its previous owner was the Southern California Edison Electric company who used it for power line survey throughout California. In fact its is still wearing its original 1974 colour scheme from Hughes. Many hours were spent in the research and going over the logs (luckily I have an understanding wife) and I eventually managed to get to a deal that made sense to both parties. Almost 5 months after first hearing about the heli, me and Steve Halliwell, one of the G-LADZ owners set off from Manchester early one Sunday morning bound for New Mexico. Im still amazed at the number of people we talked to (even some Americans) who don’t realise that NM is a US state and not part of Mexico! The owner Gary Beeson,kindly collected us from the airport in El Paso and we set to work. Firstly the blades had to come off which was relatively easy then the vertical stabiliser unit and then the skids had to be then replaced with stubby artificial shipping legs. All this so the 500 could fit into a standard ISO shipping container for its sea voyage. We were also reminded by the owner to keep an eye out for the Black Widow spiders that also occupied the hanger. “Its rare they’ll kill you- just make you kinda sick” – said our host! I will be giving the aircraft a very thorough pre-flight for a while! All went reasonably well until we tried to fit the short legs- they had been manufactured specially in the UK for us to an existing 500 pattern but had been made too big. We found this out when the heli was sitting up in the air about 4ft on its crane! A lot of head scratching went on and several ideas bounced around like sitting the aircraft on its belly on some mattresses until we could get replacements made. Eventually I managed to take a trip 1hr into the local town and get a grinder and disks and ground them down to make them fit. Field engineering at its best! Hours before the container was booked to arrive the shipping company came up with whole draft of additional paperwork and compliance issues we had to overcome – including proving that the aircraft was not a ‘munition of war’ and could not be adapted for such. Many emails and calls were made across the Atlantic and eventually the box tickers were happy and container arrived on site. A wooden blade box to protect the rotor blades was constructed by me on site and all the other parts covered in bubble wrap and tagged. A 500, even on shipping legs is quite tall and we had only about 2 inches of clearance at the top of the container. It was a very tense time as I watched my new pride and joy precariously balanced at the container entrance but in she went – a real team effort! Its been a great fun trip but exhausting –importing an aircraft is not for the faint hearted. She is now on her way to the UK sailing out from Huston to Felixtowe, where she will go by road to Redhill for maintenance and return to the air hopefully by early next year-I cant wait! Expect futher updates from the hangar. With thanks to Liz my wife, Steve Halliwell, Gary Beeson , The RBS , and Heli Logistics at Redhill and everyone else without all this would not have been possible.